By now, you may have come across the term IoT, which means, the Internet of things. IoT has evolved from the concept of Machine to Machine (M2M) communication, which means machines connecting to each other without human intervention. M2M is the process of integrating with cloud, managing it, and collecting data. The IoT integrates greater compute capabilities and makes use of data analytic's to perform meaningful extraction of information. IoT has become the common place for everything, starting from homes and industries, to enterprises. Connecting everyone and everything, it is making the world future ready with smarter and better functionalities. Although, this is the initial stage of the internet of things, extracting the full potential of it requires the businesses to understand the opportunities for the creation of value and carefully address the hidden challenges. IoT is a group of connected devices that are accessible via the internet. The term ‘things’ in IoT refers to a car with in-built sensors or a person with a heart rate monitor, i.e. devices that are assigned with an IP address and have the ability to collect data and transfer it over a network without the need of any individual. The technology embedded in the objects helps them to communicate with internal states or the external environment, which in turn affects the decision making. Get ahead in your career by learning IoT through Mindmajix IoT Training. What is an IoT Device? Any device which has a sensor attached to it and has the capability to transfer data from one device to another through the internet is known as an IoT device. IoT devices consist of softwares, wireless sensors, actuators and computer devices. They are connected to a particular device that operates with the help of internet, enabling the data to transfer among the devices or people. For instance, IoT systems in your car detect the heavy flow of traffic and send a message automatically to the person waiting for you. Samsung has released devices running with IoT enabled in them, some of those include hubs, smart outlets, motion sensors, water leak sensors, arrival sensors, and many more. The company also launched a complete home monitoring kit for making an ordinary home to smart home. Bosch has decided to become a leader in the IoT space, it has already started manufacturing sensors for IoT devices and a few smart home appliances. FitBit is the pioneer in manufacturing of smartwatches and health monitoring devices. These devices can be connected to your smartphone, enabling you to track your health and set fitness goals. Google’s Daydream is an IoT enabled virtual reality device. It can be used with the help of your smartphone inserted into the device. The VR experience can be streamed with the help of chromecast. Less amount of battery consumption, high performance are the significant factors which play a major role in the design of electronic devices. These IoT devices collect a massive amount of data and is stored on a reliable storage server. Cloud computing can seamlessly handle huge amounts of data. The data is then processed and learned, helping us to discover electrical faults/errors within the device. 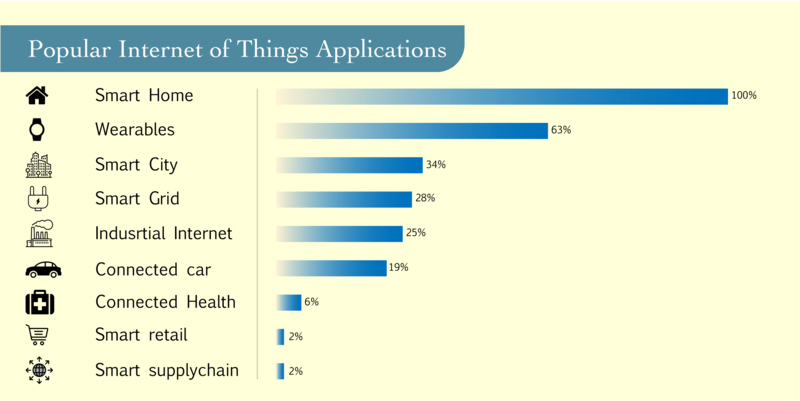 The fact is that the Internet of things rely a lot on sensors, especially real-time. As the spread of these electronic devices is more in every field, their usage may trigger a massive flux of big data. To make communication possible, internet connectivity is required where each device is represented by an IP address. Although, the addresses are less in number according to the IP naming. Due to the increasing amount of devices, this naming will no longer be sufficient. Hence, researchers are finding an alternative for the IP naming system to represent each physical device. Every device that is connected creates opportunities for hackers. These vulnerabilities are wide, even for a single device that is small. The danger posed includes data transfer, malfunctioning devices, device accessibility, and devices connected constantly. The main challenges in security remain the safety limits associated with producing devices with low cost, and the rising number of devices that create more chances of risks. How to address current requirements? With the help of an integrated solution, IoT security can be accomplished. This solution offers segmentation, visibility and protection for the complete network infrastructure, like the holistic approach known as security fabric. Learn: With an overall network visibility, every security solution can authenticate and differentiate IoT devices to create a risk profile and allocate them to IoT device teams. Segment: Enterprise need to understand its IoT attack surface, so that the devices can be segregated into policy-driven groups depending on their risk profiles. Protect: IoT groups which are driven by policy and have inter network segmentation will enable inspection, monitoring and policy enforcement depending on the activity at different points in the infrastructure. Internet of Things is all about interaction between applications and physical devices. An IoT development team should be essentially large and developers are divided into different areas depending on their respective works. Some of them include networking, software programming, security implementation, hardware programming and system engineering. IoT development demands proficiency in some of the programming languages, both for hardware and software. So, an IoT developer needs to learn basic programming languages for embedded systems like C, C++ and some high-level languages like Java, Node.JS and Python. IoT development consists of a lot of hardware prototyping, to achieve this, it requires building of circuits and integrating them on breadboards. Understanding of electronics and various electrical components like capacitors, resistors is essential. Sensors are the crucial part of IoT, without them, it becomes hard to collect data from its environment. Knowing the functionality of these sensors can help developers to build devices more easily. The Raspberry Pi has become very popular because of its size and efficiency. It is a fully capable computer with very less cost, it is preferred mostly by experts in computer science and electronics for assembling prototypes. So, it is well suited for IoT development. Similar to any other digital network, the IoT devices are always connected to Internet and are vulnerable to cyber attacks, like the denial of service attack. As most of the devices are embedded in our homes we need to consider this as a top priority. Smart Home Smart home is a fully automated environment equipped with sensor based devices. It includes home appliances, smoke detectors, windows and door locks. Wearable devices are known as technology infused devices which are worn by humans on their body. They are smart watches, smart glasses, etc. A smart city is a technically developed region with advanced information and communication technologies to improve the quality of government services, operational efficiency and share information with the public. A Smart Grid is a modern system which delivers electricity. In a traditional grid, the flow of electricity is only a one-way process whereas the smart grid processes two-way communication of electricity data. It enables real-time collection of data which constitute for electric supply and demand while transmission and distribution process. The integration of Big Data, wireless networks and analytical tools with industrial equipment is known as industrial internet. It incorporates ideas of specific pieces of equipment or intelligent machines, with IoT and Embedded Technology. Connected car has become a buzzword in the automotive industry, the presence of devices in the automobile which are interconnected with one device to another. These cars help us with generating an alert while there is a collision, heavy traffic flow and other safety alerts. Smart retail means a smarter way of experiencing shopping, it encompasses a group of technical solutions enabling us to turn a conventional physical store into an interactive point of sale. With the help of certain tools, smart retail enables retailers in getting detailed knowledge of the customers and business, increase the sales and enhance the operating process. Example: Paytm has launched it’s Smart Retail Facility. The value of supply chain extends to every industry without limiting only to retail. The digital transformation which we are facing today has provided a platform through which all the businesses around the world can become efficient from end-to-end. IoT training and certifications are based on a particular job role with dedicated programs designed to support the growing need for specialized talent. Explore IoT Sample Resumes! Download & Edit, Get Noticed by Top Employers! Download Now!